These delicacies is mostly preferred during holidays, feast of saints and town fiestas. 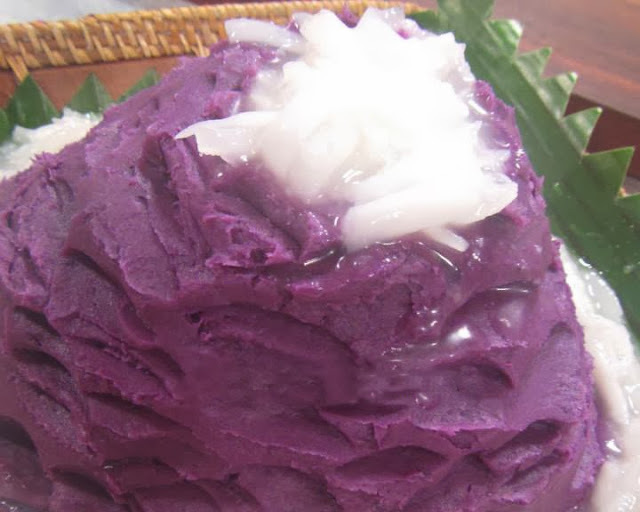 It is made from boiled & grated purple yam which is locally known in the Philippines as ube. The texture is a little chewy & creamy. And the flavor of the ube should stand out. 1. Cut the boiled and peeled Ube into 2 inch cubes. Using a potato masher or potato ricer, mash until smooth and no chunks are visible. 2. Mix the ingredients in a pan, leave out half of the butter. 3. Cook stirring continuously on medium heat until the liquid is reduced and fully absorbed by the yam, about 5-10 minutes. 4. Turn the heat to medium low and continue stirring until you get a very thick consistency. 5. Brush your serving pan or container with remaining butter and spread out the Halayang Ube. The butter will prevent it from sticking to the container. 6. Cool and refrigerate before serving.